Greetings for a bright and beautiful year to dawn, and let there be peace and happiness, hope and vigor to sustain our growth and cheerful warmth was spread through the thought of sharing. 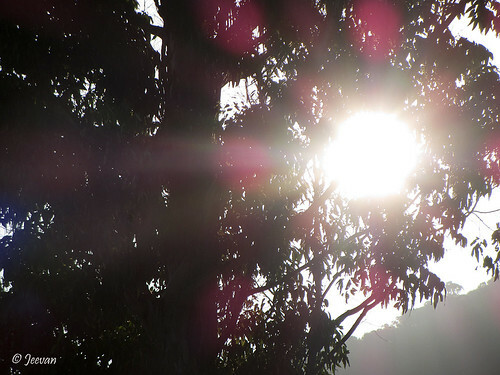 The picture above was captured during the morning hours (in March) when the sun rise above a mountain and peek through the branches and leaves of a tree, at Cloud Mountain – my favorite part of Western Ghats. It make feel of waving a good bye, as well warm smile as we leave the pristine mountain landscape. The year has almost come to an end with Christmas and New Year ahead; I convey the greetings to you all for the same, first. The mood seems to be refreshing every time a year set to dawn or beginning something anew and this time too I feel the same, though I decided to skip making Christmas tree that followed by lighting for New Year this time, the feeling of celebration happening around could not prevent giving a sense of happiness to me. Though the mind doesn’t agree to celebrate, when still many of our people are affected by flood and rain haven’t returned to normalcy, my anticipation with the year ahead were lot. There’s a promising feel in the air, which I don’t want to disappear, and the mind also makes conclusion with an urge to renew the activities to do much better. I don’t know what things going to happen next year and I wasn’t sure about my anticipation to share anything right now. But hope for the best, as it is yet to come. So far this month, I have done only two posts and that too on the experience related to flood and rain. December has been a devastating month for some time lately, with great disasters taking place at this time mostly, the torrential rains and flood had made this year an unforgettable one revealing a face of Chennai that the modern Chennaities unseen before. December has been my favorite month always, despite being a primary season for mosquitoes, and the beginning of Margazhi – the Tamil month and the coldest season of the year, and the only time Chennai becomes cooler as it is well known for the hotter weather almost the year. December brings me memories of travel in past, as some of the places where explored during this time and trying to connect the moment and time of each passing day make feel cherished. I also decided to make use of this month to explore places around the Chennai that I wanted to do for some time and also waked up on the day 1 of December with an active mind-set but what happened keeps me away from almost everything and also couldn’t blog on things I intend to cover this month. But later my laptop becomes a problem, which perhaps I guess is because of the disaster. When I opened my laptop after more than a week, I was slightly taken aback seeing at its condition of dirt and dust spread around the screen and keypad. I thought something could have happened and when I switch on the device I was asked to select windows to go inside rather right into the desktop. The screen read windows memory diagnostic and later it took long time to boot and unresponsive from certain keys make me feel useless to hold back the device rather way to service center to mend on things early. I didn’t expect it to make such expenditure on hard disk and keyboard, but glad I got back the data’s that stored in the hard disk, which was converted into an external hard drive. With the new and replacement from 320 to 500GB hard disk, the laptop works pretty good and quicker than earlier and I also decided to hold minimum files on the computer to keep alive the swiftness. Though we use hand pump occasionally, during the flooded moment it helped us getting water when our sump and bore wells were fill by rain and sewage water. Not only us, many people in the locality used the hand pumps during this time since there was no electricity for more than 3 days to power motors to fill the over tanks with sump (metro water) and bore well waters. Chennai once infamous for water problem, haven't been through at least for last five years due to enough rainfall during the seasons of monsoon in past has make forget pumping. This rain people had restored the activity. Though torrential rains caused suffering, it remained us the significance of certain things and trigger memories. I remember, once people use to wait in line to fetch water from the street pumps (as not many hold pumps at their home then) and the water will also be released between certain time and sometimes people has to wait throughout night when the time of release becomes uncertain. 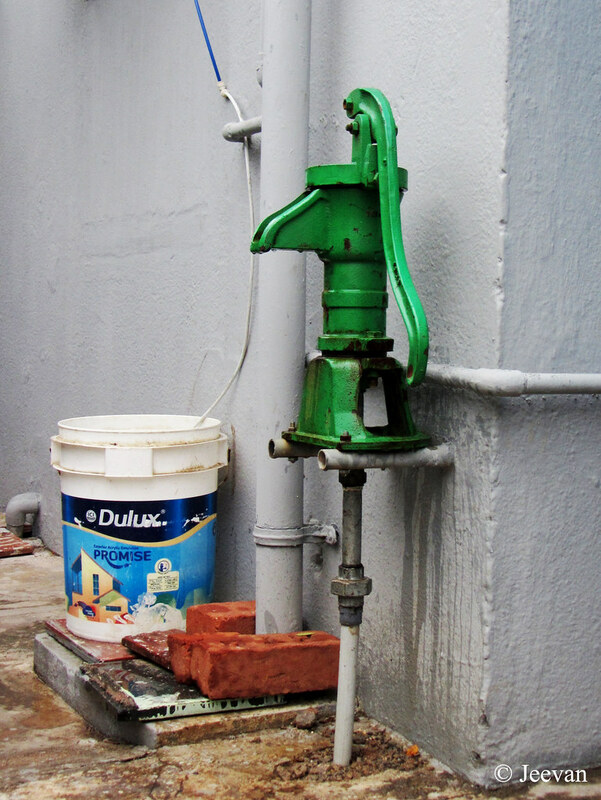 I remember the time we got water connection at home and a hand pump being installed by the corporation workers. They dig the road across and brought a pipe from the main pipe line on the other side and seeing water pouring through our hand pump was a happy feel. Even before we got water connection many houses in neighbourhood was connected with hand pumps and seeing those, I truly wished we had one and I was interested in pumping and many a time it would be very hard and I would make pour very little. At the house here, there's a pump at ground floor and also on the first floor and as we moved there during the flood the hand pump helped us (there was not only no electricity, but also the sump water was polluted by the mix of sewage in rainwater) so we are dependent on the hand pump. Though we filled our over tank before rain started to flood and power goes off, the water wasn't enough for us and gladly the hand pump was there and we used it for domestic purpose and can waters for drinking. P.S. Some keys on my laptop’s keyboard stopped working, so was force to post through mobile... sorry if I couldn’t reach you blogs, but I trying to read all. As you all know the torrential rain that stroke Chennai, last week, has washed off the city leaving very little places apart. December 1 recorded the highest rainfall in Chennai breaking down a 100 years history. Though we are affected in the usual way of rainwater flooding our home, this time it was threefold in height of coverage and electric was unplugged for more than 3 day and no mobile signal for 48 hours. The northeast monsoon was at peak for last one month and from the time of Deepavali there were more than couple of constant downpours making Chennai float in water and Dec 1 seems to be the climax. Glad the upper portion of this house was unoccupied from the first flooding time on Nov 15 and we used the upstairs as a temporary shelter to keep ourselves from calamity. Though it struck us in different ways this time with no power, and signal lose of mobiles and the scarcity of milk and can waters make brief trouble but what we have gone though was nothing when it comes to the worst hit areas like the southwest suburbs and places around the banks of river Coovum and Adyar. Even though it was a great disaster Chennai faced ever or post tsunami, the volunteer’s involvement in rescue and relief operation was heart-warming than the painful disaster itself. Except the time of absence of mobile signal, I was keep checking Facebook (as it was the only source of information for me since there was no electricity at home to watch news/Wi-Fi for internet) for the update on rain and relay on things happening around and related to flood relief. I was quite amaze at the selfless act of youngsters, even before the local body and army arrive, the young people leap to rescue without waiting for anybody make feel the humanity doesn’t’ fail anywhere. SMSs, messages, calls were flying wherever possible on things on available and needed and people kept sharing messages on relief and rescue and teams up to promote the activities around. Beyond the manual helps, fishermen’s in boats were the first to land on water and gave wonderful aid to people to come out of their flooded homes and provided relief to those denied to exit. It’s been 10 days the disaster stroke us and the surroundings continue to stay wet as it rained mild to heaver throughout last week and due to waterlogged the courtyard remains sludge and need to be washed away. Climbed down to home today, the entire day was spent on setting things around and this time we decided to stay above for some time, since the weather continued to be unstable with heavy spills now and then we doesn’t want to experience trouble again. Glad the rain decided to stop and the sun was showing up nicely today, sending down hope rays that rain don’t come again and would be lighter even if it showers. Last 10 days was spent without watching television and no update on blog, but I continued to Facebook using the mobile network and later on Wi-Fi. Most of the time was spent on browsing newspapers which carries reports on torrential rain and floods in detail. The relief and rescue effects took by volunteers and uniformed personnel’s was the most impressive things about this time and without them it’s impossible for Chennaities to wake up from the disaster. Hats off all... because of you all we are safe here (though we aren’t affected the most, in some ways I believe their attitude make things possible) and wish you all the very best for the operation on relief and rescue. Let’s continue to stand for each other.